FABULOUS NEW ARRIVALS AT TIME FOR TEA ANTIQUES & ECCENTRICITIES! 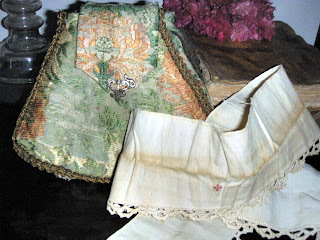 Materials and Techniques: Silk brocade, Gold metal trim, Silver metal motif. 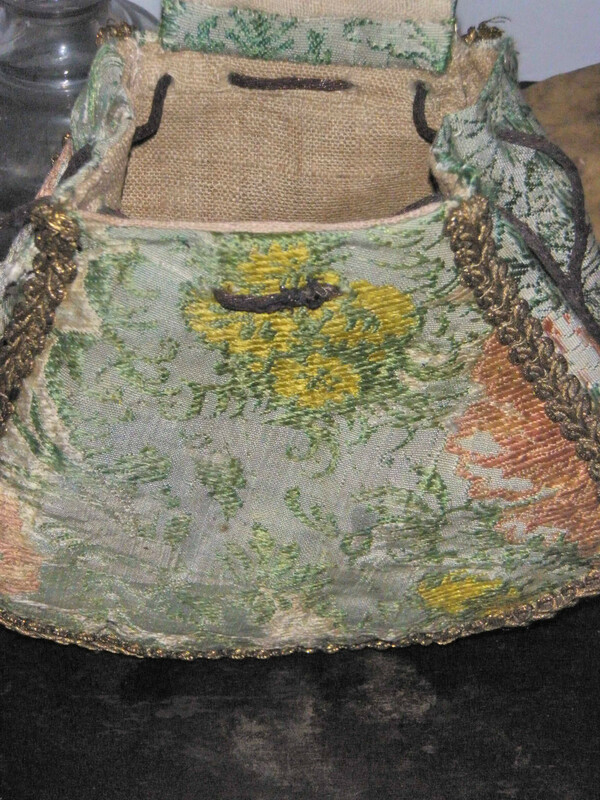 This is a wonderful early 18th century European, probably Italian or French drawstring purse, hand made of a very complex, beautiful and ancient floral polychromed silk brocade and dark gold metal trim. It is simply huge! I’ve collected a number of antique 17th and 18th century gaming purses and sold quite a few over the years, but this is one of the most unusual and beautiful I have the chance to find. A very similar piece can be viewed at the Bainbridge Lace Collection from the University of Rhode Island Historic Textiles and Clothing Collection. The silk was produced by hand loom, probably in France during the first half of the 18th century. The complexity, beauty and high quality of the fabric would made it very expensive to produce, so it was pure luxury. This purse is mouthwateringly beautiful as objet d'art, a covetable little treasure in its own right, as well as being container for other even smaller treasures such as silver pencils, gold coins or embroidered lawn handkerchiefs. 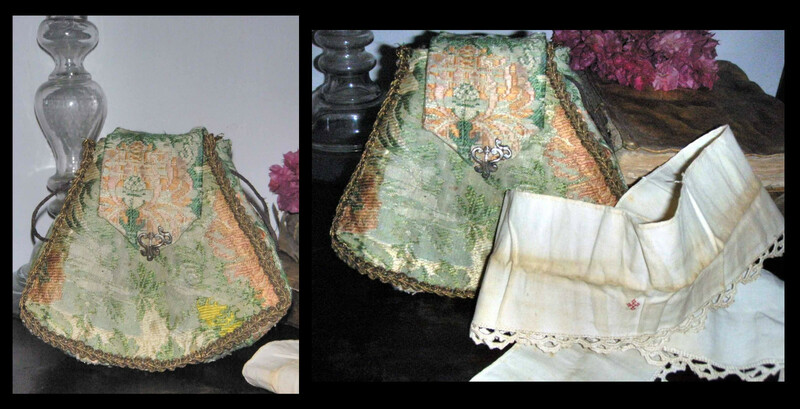 The purse was acquired with the long white cotton collar or stole. The collar features a red hand embroidered symbol in the center and wonderful hand made crochet lace trimming. 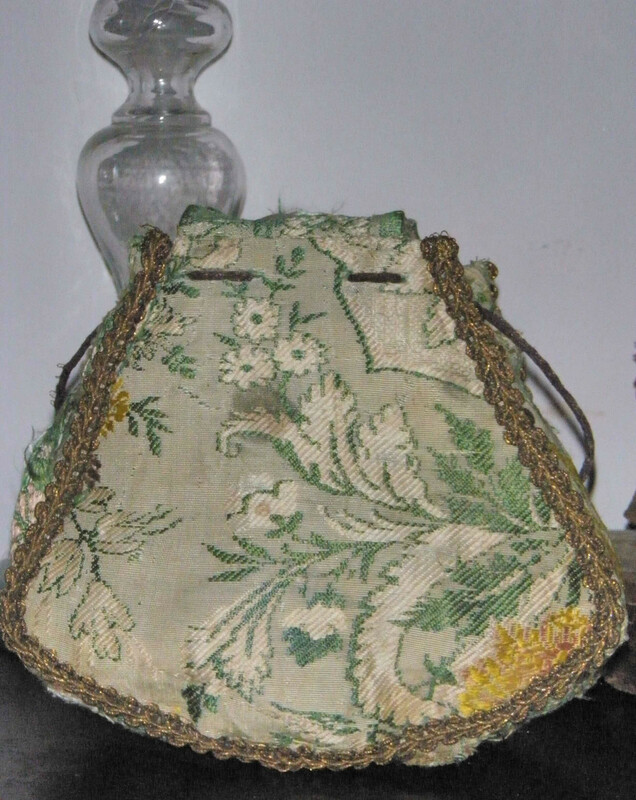 Bags in the early 18th century were attached to what were called "girdles" which were fastened to the waist. Embroidery, gold or silver metal trims and even jewels adorned these articles and were used to show status - the richer the person, the more elaborate the bag. The 17th and early 18th centuries saw more variety and both fashionable men and women carried small purses with more complex shapes. I believe this amazing piece would be a Gaming or Coin Purse. Card players kept their coins or gambling counters in these beautiful ornamented purses, which had a stiff botton so that they could stand upright on the table and drawstring. Sometimes the botton was decorated with a family crest, coat of arms or initials, so that there could be no doubt as to the owner. 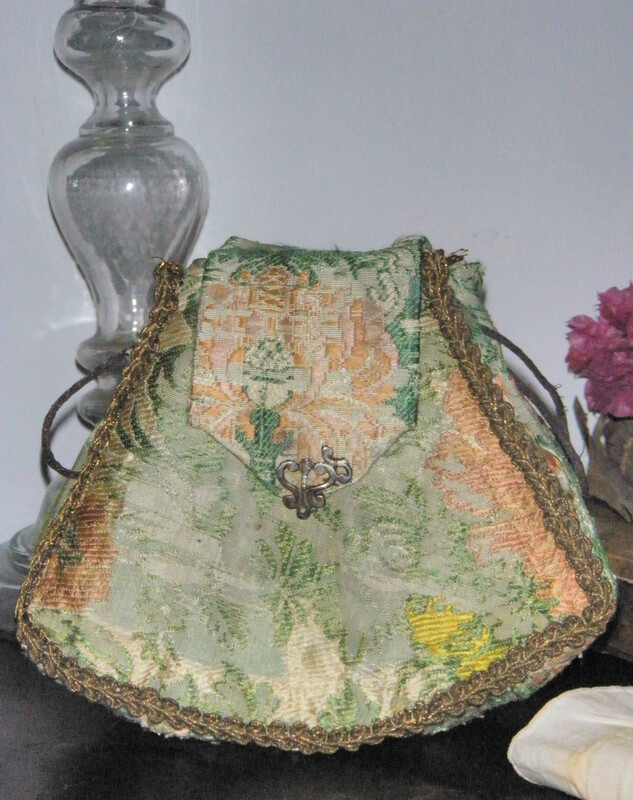 This gorgeous light green silk ground purse is woven with floral and foliate motifs in beautiful colours: different shades of green, salmon, lavender, yellow and light pink. It is very unusual in shape, since it´s fashioned from two shield/triangular panels. Front and back edges are decorated with beautiful and elegant braided dark gold metallic trims. The botton is flat, rectangular, and sides are also right-angled. Each of the five panels/quarters features floral motifs. The purse closes with a dark brown drawstring. The drawstring design allowed the owner to easily open and close, whilst keeping the contents hidden from other players. The purse has also an unusual feature: a folding lap that covers and closes the top and falls to the front. The lap is embellished at the botton edge with an ornate silver metal piece, probably for decorating or closure (the piece is not complete). 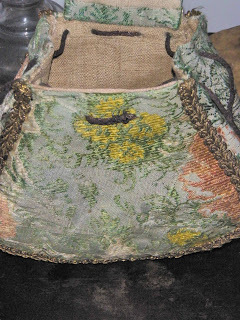 This is a rare and pretty motif on such early purse, although as previously said, purses could be carried by hand or tied to the skirt or belt. The purse is fully lined in plain linen. No doubdt this purse was a more luxurious model than the usual men and women bags and purses made to store or carry coins, papers, alms, bibles or holy relics, for it is made from costly materials. These antique and fine pieces are not found very often, even less in this good condition, considering the age of the purse is well over 220 years. 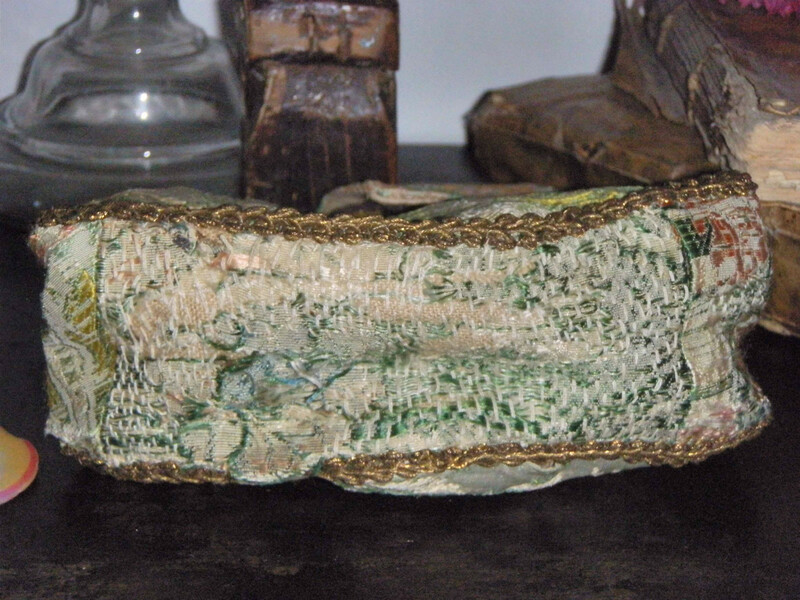 It's really quite amazing how very distinct and deep the colors have maintained over the decades, surely this purse, although shows wear, was well cared for and properly stored. Purse Condition: Very Good. The purse is Strong and Clean. Steady. The silk shows wear and its fragile/weak in several areas: to the top left side, at middle level to the right side and the botton shows period hand repairings/stabilization all over, so most of the floral design is missing although the silk is under the stitching. Front and back are in perfect condition. The lap is in perfect condition as well. The silver metal decorative or closure piece is not complete but looks very beautiful. The lining is in Perfect condition. Purse Measurements: Height: 5 1/2"; Botton Lenght: 8"; Top Lenght: 3 1/4"; Depth: 2 1/2". Collar Condition: Very Good to Excellent. Strong and Clean. The collar shows yellowing or rust spots due to wear and age. No holes, no odours. The lace is in Excellent condition. Collar Measurements: Lenght: 33 1/2"; Widht: 3 1/4".